The FamiLee Jewels: Glass Addictions- an amazing artist. Lamp work artists amaze me. Their work is so unique and inspiring. The things they create from glass and fire and imagination ore stunning. Jennifer Cameron of Glass Addictions is such an artist. 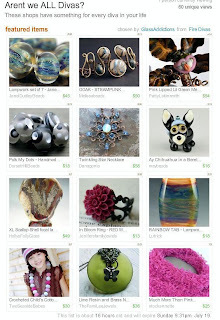 Jennifer was kind enough to include TheFamiLeeJewels in her etsy treasury "Aren't we all Divas?". When I visited her shop I was delighted to see her work. My particular favorite beads that she makes are the ones with metal "studs" in them. So delicate yet they have an industrial feel to them. Take a look at this one. It's fabulous. You can view Jennifer's work in her Etsy shop or her website. I just saw this! Thank you so much for mentioning my shop on your blog!